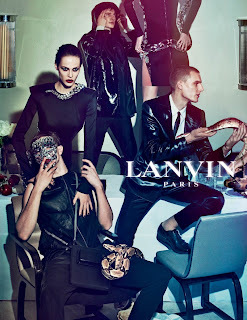 What do you get when you throw a bunch of massive pythons, bejewelled masquerade masks, tuxedo suits, Steven Meisel and models Aymeline Valade, Marte Mei van Haaster and Othilia Simon into the mix? 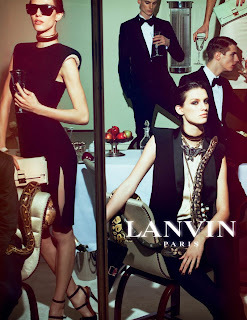 Well..., Lanvin's Spring/Summer 2012 campaign and my idea of the perfect dinner party. 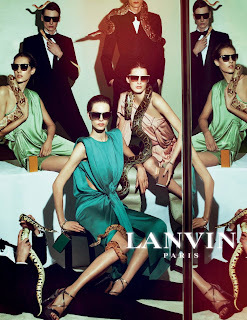 Donning Lanvin's sleek, figure-hugging silhouettes and incognito shades, Valade, van Haaster and Simon bring an air of excitement, mystery and danger to the table flanked by male models Aaron Vernon, Johannes Schulze and Angus Lowe. The brilliant casting of Valade, van Haaster and Simon, each of whom possesses that rare mix of androgyny and womanly allure results in a campaign that is intoxicating and transfixing.